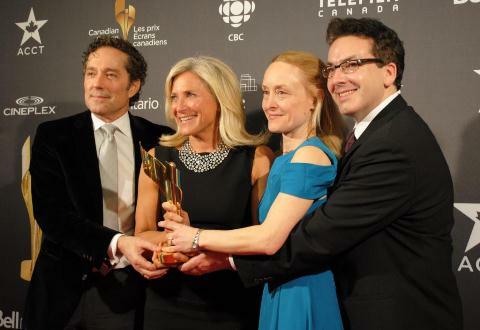 Mark Ellis and Stephanie Morgenstern at the Canadian Screen Awards | TV, eh? I asked Mark and Stephanie how they felt about being honoured for Flashpoint after its final season. Of course, I had to ask about the writers room and Aubrey Nealon who took home a writing award for his Flashpoint episode “Day Game”. Interestingly enough, we had recently watched a short film called The Rememberer from an earlier year of the Crazy8’s Film Festival in which Stephanie played the lead, a woman whose lover devolved through various stages of life. I asked her if she had any encouraging words for short film and web series creators who are starting out.